Delivery: add $3.00* (Inside City Limits Only). List your info on our Cody Info Page, Free! 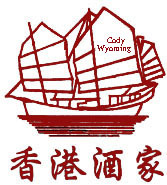 Copyright © 2013 Cody Hong Kong Restaurant LC, All rights reserved.